Despite trailing 3-0 in the series, the Sri Lankans showed their competitive side in the fifth and final ODI against England in Colombo to clinch a morale-boosting 219-run victory. The day began well for the Islanders as they won the toss, with captain Dinesh Chandimal electing to bat first. The trust he placed in his batters was well rewarded as the home side managed to amass 366-6 in their 50 overs. Sri Lankan wicketkeeper Niroshan Dickwella and fellow opening batsman Sadeera Samarawickrama were explosive at the top for the home side, posting 137 runs for the first wicket before Samarawickrama (54 off 48 balls, eight fours) was was bowled in unusual fashion shortly after reaching his half-century in the 20th over. Moeen Ali (2-57 in eight overs) was the bowler who snared his wicket, with the umpires having to confirm his dismissal through television replays after a subdued appeal by England. 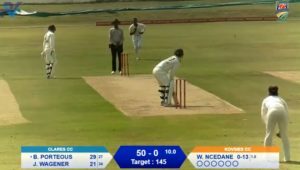 Dickwella was joined at the crease by captain and No 3 Dinesh Chandimal as the two continued the onslaught against the English bowling attack. Player of the Match Dickwella (95 off 97, 12 fours) lead the charge, but he will be disappointed to have missed out on his century after top-edging a delivery from Ali to backward point. He would have become Sri Lanka’s first ODI centurion in 2018. Chandimal took over the charge – after having been dropped on six – and, alongside Kusal Mendis, put the English bowling attack to the sword. The two posted a quickfire 102-run partnership for the third wicket as the home team raced to 270-3, when Mendis (56 off 33 balls, one four, six sixes) fell to a short ball from Liam Plunkett. Tom Curran redeemed his dropped catch off Chandimal by getting rid of the Sri Lankan following his impressive 80 runs off 73 balls, including six fours and two sixes. Curran then dismissed Thisara Perera shortly after as the Islanders finished their innings on 366-6. The English response was unexpectedly calamitous as the visitors found themselves 28-4 in the eighth over following a top-order collapsed induced by a destructive spell from Dushmantha Chameera (6-0-20-3). With regular captain Eoin Morgan not around to anchor the innings, the touring team where in trouble as the top four batsmen each lost their wickets quickly – including replacement captain Jos Buttler for a duck. Ben Stokes (67 off 60 balls, 12 fours) and Moeen Ali (37 off 37 balls, five fours, one six) tried to reconcile the innings with a 79-run stand for the fifth wicket before Akila Dananjaya was introduced into the attack. Dananjaya was at his destructive best as he ripped through England’s middle- and lower-order, picking up 4-19 in 6.1 overs as the visitors were reduced to 132-9 in the 27th over. It was at this point that the heavens opened – as regularly experienced during England’s monsoon-season tour of the island nation – to mercifully put the English out of their misery. Sri Lanka sealed a resounding 219-run victory on the DLS method, which offered some consolation in losing the five-match series 3-1. Sri Lanka and England face off in a once-off T20 encounter on Saturday before the Test series begins on the 6 November.